The neighborly inclusive place to share information, discuss local issues, find solutions and build a vibrant community. Join over 700 members! Participate via e-mail or the web. Tune in via Facebook and Twitter. 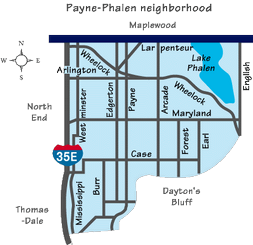 This forum is a friendly, but independent complement to the District 5 Payne Phalen District Council. East Side Pride x4! Use our map to find neighboring forums for Dayton's Bluff, the Greater East Side and District One. Diversity: 65% people of color, including 30.6% Asian, 16% Black, and 14% Latino. 35% of the population is White, non-Hispanic. 55% of households earn less than $50,000/year.